This post is mostly about issues of privacy surrounding Gbuzz. If you don't care about the private use of Gbuzz and want to use Gbuzz to share everything with everybody on the internet, you don't need to bother reading this post. However, if you'd like to give Gbuzz a try to share with an intimate group of family and friends without exposing yourself to the rest of the world, then you may find this post useful. I understand Gbuzz is web software, so it will likely see many changes perhaps even quickly. So the information in here (and my gripes) could be addressed very quickly. But we'll see. Before I go any further, my comments below are premised on how I treat gmail. For me, gmail is a place when I have private conversations. It's a place where I can assume that the people I communicate with don't necessarily know any of the other people I communicate with (at least if I'm careful with email To: and CC: lists), and ordinarily my address book is not exposed to the people I email let alone the whole world. These are qualities also shared by standard email services, and I assume I'm not alone in how I regard Gmail. I consider these desirable features not just for myself, but also for the people with whom I communicate. And I think it is an underlying assumption of email communication and a generally understood etiquette (which is why long email To: lists are generally considered a no-no when they contain a bunch of people who don't otherwise know each other). This leads me to my first gripe about Gbuzz. When you first sign into your Gmail account after Gbuzz has been enabled for your account, Google requires that you create a public Google profile. 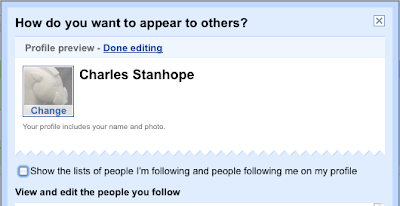 Google profiles are something that Google rolled out a while ago that is associated with your google account. They are intended as a place where people with Google accounts could provide discoverable information about themselves. Generally Google profiles have been something that could be ignored while using Google services, but it appears Google is being more aggressive with attempting to expand how many users create (and potentially fill out) their public profiles. I assume this is in an attempt to convert Gmail users into instant Gbuzz users and thus creating a very large, public social network in one fell swoop. Perhaps there is a technical reason for requiring public profiles to use Gbuzz, but I can't imagine what that would be nor that these technical reasons couldn't have been surmounted if Google didn't want to require public profiles to use Gbuzz. Now I admit that your public profile does not need to contain much in the way of identifiable information, but if you are like most people, and use your real name when emailing, and enabling Gbuzz is the first time you've created a public Google profile, then it will at least declare your name. That's not such a big deal right? This is where I get a little upset because Gbuzz takes your initial set of following as many of the people in your list of Gmail contacts without really explaining the ramifications. If you accept this default option, your profile will now expose a list of names from your contact book in the following list! Granted these don't necessarily expose email addresses and other personal information. Just their names and public profiles, but even the relationships alone can be revealing for people. Not just your relationship to them, but also their relationship to you. You are making decisions on the behalf of others and the others don't get a say in the matter. I think making this the default behavior is a poor choice. Google should not be treating your Gmail contacts like something that can be easily turned into a social application's buddy list. They aren't the same in the least. Your Gmail contacts were generated over months or years under a wholly different set of assumptions than your typical social application buddy list. My second concern in that in the attempt to leverage Gmail to launch this social network app, Google has conflated the private and the public domains in a potentially dangerous manner without properly warning users. After you've enabled your Gbuzz account, you can now make posts directly within Gbuzz. By default, these posts are public. Meaning they are available to all your followers (which can be pretty much anyone [see below]) as well as on your public profile (again, see my public profile for an example of what that looks like). However, you can enable a private posting which allows you to select which people are able to see your post. This is done by grouping your followers into new groups that are managed like contacts. I haven't bothered to appropriately manage my groups yet, so my friends and family lists aren't filled in, but you get the idea. The good news is once you set this privacy post option, Gbuzz seems to default to it. The bad news is that Gbuzz defaults to public and the user has to take the second step of establishing a private post. I don't think Google has taken sufficient steps to warn people that what they post to Gbuzz can be exposed to more people than they realize if they chose the default public posting. My final gripe is that while Gbuzz has a way to block followers after they are following you. 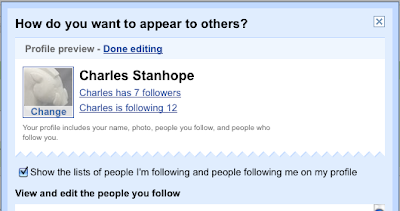 There doesn't appear to be a way to require potential followers to ask permission before following. So somebody undesirable could follow you for a while without you knowing about it. Now, if you're careful about using private posting, then you can mitigate this issue (see below). Again, all these things that I consider issues have mostly to do with how I expect Gmail to operate: as a private communication domain. Maybe other people don't feel this way, but I'm touchy not just about my privacy but also the privacy of others. It's fine to share things, but people shouldn't be ambushed into sharing things publically either by intent or by poorly designed software. I feel the roll out for Gbuzz has been poorly done. Too little information is provided to new users (I found out everything I did by trial and error with one public account and multiple test accounts I keep around), and the default for Gbuzz settings should've been highly restricted privacy. Then users would hopefully be made more appropriately aware that Gbuzz is not Gmail and that steps need to be taken to keep information and posts as private as they are comfortable with. Users should have been forced to choose to go public, not to have to stumble into realizing their posts and contacts aren't private by default. By placing Gbuzz in a convenient tab in people's Gmail window, Google has conflated the private realm of Gmail with a potentially much more public realm of Gbuzz. This will likely have undesirable consequences for users. Here's my suggestion to people interested in using Gbuzz for private sharing with close friends and family, and not interested in exposing everything to the whole world unintentionally. When signing into Gbuzz for the first time, disable sharing of your following/followers. Maybe in the future there will be more control, but for now, I feel this is the best way to go if you have a respect for you privacy as well as those of your friends and family. If you're sharing Gbuzz with an intimate group of people, making your list of following/followers public doesn't add value to the experience. You all know each other already. When making your first post on Gbuzz, select a Private post, and create a group that contains the people you most often would like to share with. This will make this private posting group the default (but keep an eye on it to be sure). Now if you always use this private group for your postings, you don't have to worry about accidentally leaking information outside that group of contacts, and your posts won't show up on your public profile. Even if you get new (undesirable or unknown) followers, you will not reveal anything to them without you adding them to your private group. This creates a de facto permission to follow feature (which is perhaps what Google intended, but they should've made it clear). If you follow those three steps, I think you will find that your Gbuzz stream is about as private as your Gmail account (assuming you trust the people in your private posting group). Finally, despite my gripes, I do think Gbuzz has some potentially nice features for staying in touch with friends and family, especially if you already use Gmail. I intend to give it a try. I hope you do too.